Do you say fall, autumn, or both? Is it getting cooler where you live or is it still in the 90's like it is here in Florida? In any case fall is here. Check out math activity for use with Google Drive™ or Google Classroom™. 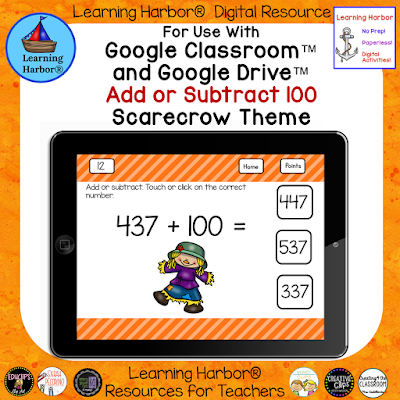 When using this interactive, self-correcting game, students will practice adding or subtracting 100 from a three-digit number. This is a user friendly game that is easy to implement. You and your kids will love it. Your kids will be engaged and having fun as they improve math and computer skills at the same time.